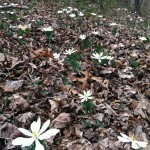 Traditional Cherokee basket makers use bloodroot (Sanguinaria canadensis) to make dye. 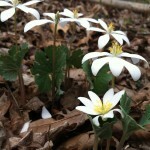 They reported that has become difficult to find bloodroot growing naturally in the woods. This project was designed to help the basket makers grow bloodroot at their homes by providing them with bloodroot growing kits and training. This project is working through the Qualla Arts and Crafts Mutual, Inc. to provide training to its members and to the high school basketry classes and the Oconalufftee Institute for Cultural Arts. A workshop will be offered with a Powerpoint presentation illustrating how to grow the plants followed by a hands-on demonstration on how to prepare the bed and plant the bloodroot. Kits will be prepared for each participant containing planting stock, soil amendments, laminated and illustrated instruction cards, a growing manual, and a CD showing how to plant and grow. The hands-on demonstration of how to plant bloodroot will be done at the home of an elder basket maker so the elder will have a bloodroot bed on site. Seeds with planting instructions will be provided later in the season. Some parts of the workshop will be videotaped to create an instructional YouTube video for other basket makers to learn from. The video footage will be made available to the coop for their own use. Smaller planting kits will be created for high school students. 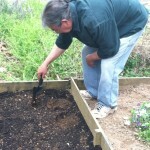 We held a series of ‘Grow Your Own Bloodroot’ workshops in Cherokee on April 11th, 12th, and 15th. Last summer the non-profit organization The Revitalization of Traditional Cherokee Artisanal Resources (RTCAR) approached us about working on a bloodroot project with traditional basket makers from the Qualla Arts Cooperative. We were awarded a grant from the Cherokee Preservation Foundation in September 2012. Dr. Jeanine Davis serves as the Project Leader. Alison Dressler and Margaret Bloomquist organized the workshop events and presentation material. They continue to develop and strengthen relationships with artists and other community members in Cherokee. For centuries, Cherokee basket makers have woven beautiful single-weave and double-weave baskets from river cane and white oak that is harvested from the surrounding land. Black walnut, bloodroot, and sometimes yellowroot are used to dye the material, creating astounding works of art. Many of the artists harvest all of the material to make baskets themselves, while others will purchase bloodroot from men and women who harvest the roots and then bring them into town to sell to artists. Bloodroot has increasingly been difficult to find in the wild. Bloodroot is an important cultural material for the Cherokee, and its disappearance from the wild is unsettling. 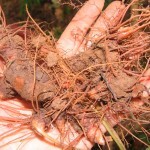 The aim of the project is to teach Cherokee artists how to grow their own bloodroot patches so that they do not have to rely on wild-harvesting and could continue to increase the bloodroot in their own patches by selectively harvesting roots, harvesting bloodroot seeds, and continuously planting the seeds to ensure their patches continue to grow. Working with the wonderful people at the Qualla Arts Cooperative, RTCAR, and the Cherokee Arts Program at Cherokee High School, we had a series of visits to plan how the workshops would look. We decided to hold a number of outdoor workshops – one at the Oconaluftee Indian Village, one at the high school, and a few at artists’ homes throughout Cherokee. Many of the basket makers stay close to home during the day, so having these visits was a nice way to have one on one interaction and to share all of our experiences with bloodroot – from growing it, to harvesting it, to making it into dye. Each person who attended the workshops received a kit that included an eight page production manual, a laminated planting card that explained planting both rootstock and seeds, thirty roots to plant, a seed catcher to collect seed from mature plants, lime, a hand trowel, and gloves – everything needed to plant a bloodroot bed. We held the first planting workshop at the Oconaluftee Indian Village, an authentic Cherokee working village that portrays Cherokee life and rituals from the late 1700s. The village has an area dedicated to traditional Cherokee plants where we made a planting bed after discussing the lifecycle of the plant, site selection, and the importance of selective harvesting. The conservation side of the plant was highly emphasized. When people were just harvesting small amounts for personal use, population pressure was not as much of a concern. Today, bloodroot is not only harvested for use as a dye, but also has a strong international demand as a medicinal ingredient. For example in Europe it is used in dentist’s office as an oral medication to fight plaque and gum disease. Over the next day and a half, we visited other homes throughout Cherokee to meet basket makers and plant bloodroot patches at their homes. Interest in learning about bloodroot cultivation quickly spread throughout Cherokee, and we were able to hold smaller scale impromptu workshops at the New Kituah School, a Cherokee Immersion School, as well as at the Qualla Arts Cooperative. 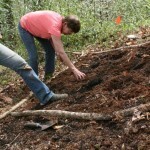 The following Tuesday we returned to Cherokee to plant a bed with high school students in the woods behind the school. The high school has an extraordinary traditional Cherokee Arts program where students learn traditional basket making and dye. Students had worked with the dye before, but some had never seen the plant in the wild. The students were engaged and very interested in planting and even wanted to keep making more bloodroot beds. They will now be able to maintain this plot and use the roots in class for basket dye. A total of 39 kits were given out to artists and students interested in growing their own bloodroot. We will be bringing up seed to plant in June when we collect seed from the woods at the Research Station. Throughout the summer, we will continue to visit with the artists and see how their bloodroot patches are doing. We are also in the process of making a video for YouTube that will be available at the Qualla Arts Cooperative for anyone to view that was unable to attend the workshops. This is a wonderful, fun, and important project that we are very happy to be working on. The exchange of information from everyone has been fascinating. We feel very welcomed in Cherokee and are beginning to feel like it is a second home! If you haven’t visited the Oconaluftee Indian Village or the Qualla Arts Cooperative in Cherokee, we highly recommend it. The talent of the artists is truly incredible. Bloodroot propagation kits, production manuals, and other materials were provided to project participants, and information is available at the Qualla Arts Cooperative in Cherokee for interested artists. The informational video below, was created at the completion of this project for those who would like more information. Please enjoy and share. The leaf of the bloodroot will wrap itself around the flower bud, protecting it from the spring cold. Each day, it slowly opens to give the flower sunlight and warmth. 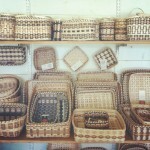 Traditional Cherokee baskets woven from river cane and white oak on display at the Qualla Arts Cooperative in Cherokee. Bloodroot dye produces the orange color and black walnut dye produces the darker brown/black color. Shirley Taylor, a traditional basket maker, helps to plant bloodroot at a site close to her home. 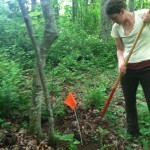 She will now have her own personal source of bloodroot in her backyard. We put the bloodroot bags in moist soil as we transported them to Cherokee. 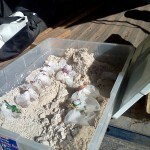 We then gave each artist who attended the workshop a plastic baggie with the seed bag and moist soil in it. 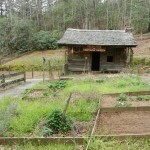 Site of bloodroot planting at the Oconaluftee Indian Village. A mesh bag is attached to the seed pod that forms on the bloodroot plant in early summer. When bloodroot is ready to go to seed, these pods explode open, scattering the seed around them. The mesh bag traps the seeds so that they can be replanted. These bags are easy to make. Research assistant Margaret Bloomquist raking dirt and leaves over the collected bloodroot seed bags until we are ready to deliver them to the artists in Cherokee. Covering the bags with leaf litter and moist soil ensures that the seeds stay moist until they are ready to be planted. We gratefully acknowledge Revitalization Traditional Cherokee Artisan Resources for the funds supporting the research. • Did You See Our Video on Growing Bloodroot?